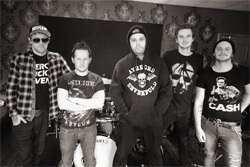 Some four years on from their first album, the successful Revolution, Leeds band Jupiter Falls returns with their second long player, Faces In The Sand Part One on the Broken Road Records label. The album comes with a personnel change, introducing Luke Hatfield on drums. Perhaps the first thing you need to know about Jupiter Falls was that it was formed by lead guitarist Deano Silk and vocalist James Hart. Naturally then, most everything revolves around this duo. That said, with twin guitar harmony and riffage, and epic soaring leads, Jupiter Falls and their music is very guitar-forward, even better, guitar-centered. The riffs are brisk and sharp, abundant and large, accounting for the Jupiter Falls bombastic delivery. Some may consider the depth and strength of the guitar parts as harsh nearing modern heavy rock, and I can understand that point. Voices is a case in point. Even acoustic guitar driven songs like Follow You, and more so Call Me, find the acoustic riffs bold, Silk strumming like his last breaths were at stake. Within all these things, Hart both blends with and echoes the guitar sound. He sings as assertive as the strong riffage, yet clean with an abundance of passion. Returning to Jupiter Falls aggressive modern guitar sound, within songs such as Voices and This Is A War We Cannot Win, Hart can add an equally aggressive and raw in his delivery. But within that latter song, you have Jupiter Falls' wild card, the proverbial ace in the hole. Amidst the strong and bombastic heavy metal, melody and harmony are woven with delicate subtlety, yet not so sublime to be missed. About two thirds in, for the guitar breakdown, the riffs and rhythms of the guitar lines sweeten the song. You'll find this motif in various and similar ways throughout the album. Having said that, of some interest is the title track. I'm not sure what Jupiter Falls was aiming for here. It's an interesting mixture of both metal ballad and anthem with lots of the aforementioned guitar bravado. But at better than nine minutes it can seem lumbering, nearly slothful. If your ears hook on to the guitar lines, you'll be able to carry on. My conclusion is rather simple. Faces In The Sand Part One is another strong effort from Jupiter Falls. If you like thoroughly guitar charged melodic hard rock and metal, which sways between an old school classic vibe and modern sharp nuances, you will enjoy this album. Recommended. 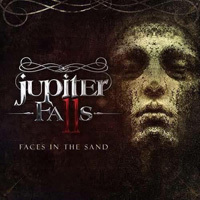 Faces In The Sand Part One is another strong effort from Jupiter Falls. If you like thoroughly guitar charged melodic hard rock and metal, which sways between an old school classic vibe and modern sharp nuances, you will enjoy this album. Recommended.